This page on the climatic conditions in France will allow you to access a number of specific pages for information on what kind of weather you could expect on your guided or independent French walking holiday. In general, northern and northwestern France is most affected by the changeable weather brought in by Atlantic weather systems whilst southern France has a Mediterranean-type climate and is warmer than the north, particularly in summer. Central and eastern France, has a more continental climate, whilst high mountain areas have their own distinctive climates with heavier precipitation, much of it as snow in winter; these areas are colder all the year round. A summary of these French areas is detailed below and there are links to a number of our specific walking holiday destinations in France. More weather information pages on our French walking holiday destinations will be added over time. We have a considerable number of independent and guided walking holidays in this region which includes the northern Auvergne, and the Cantal in the Massif Central, the Beaujolais and southern Burgundy regions, and the Jura. Here, summers tend to be reasonably warm and sometimes hot. Rainfall is generally low and tends to fall in summer when it is often associated with thunderstorms. 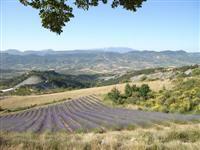 We have self guided and guided walking tours in the Mediterranean region of France, including along the Pyrenees Coast. The Mediterranean climate is confined to the Rhône valley south of Valence and the coastal areas of Languedoc and Provence at the foot of the Cevennes and southern Alps.The Baronnies of northern France falls between the med and mountain climates. Here summers are warm, or even hot, with a three month period when rain rarely falls. When it does rain in this season it is heavy and often associated with thunder. Sunshine is abundant, with as much as eleven to twelve hours a day in summer. Outside of the summer months, the mistral near Marseille and the Tramontane between the Pyrenees and the Massif Central are winds which regularly blow from the land to the Mediterranean helping to keep the sky blue. The principal mountain regions of France are the Vosges, the Jura and Alps along the eastern borders, the Pyrenees in the extreme south, and the higher parts of the Massif Central.We have a number of walking holidays in these mountainous regions of France including the alpine regions of Vanoise, Vercors, Queyras and Mercantour. These areas are the wettest and coldest regions of France and much of the winter precipitation is snow. The western slopes of the Vosges, Jura, and the northern Alps are relatively wet, whilst eastern valleys can be much drier. The southern Alps, Pyrenees, and parts of the Massif Central have relatively fine and rather warm summer weather considering their height, but this may be briefly interrupted by cloud, rain, and thunder.